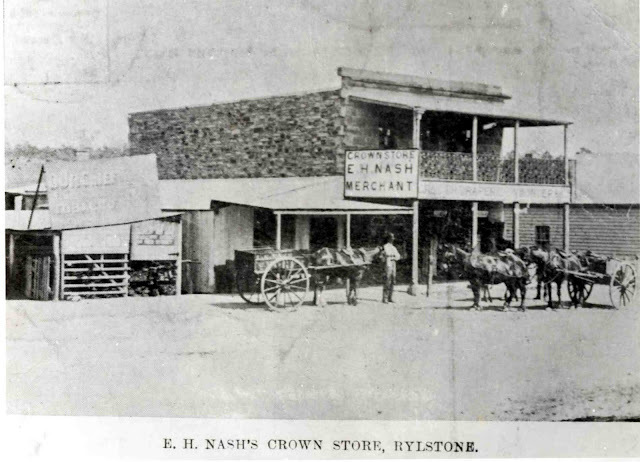 This site was established by Wal Pilz (1927-2016) to share historical information depicted in photos and images of old scenes of the Rylstone District. 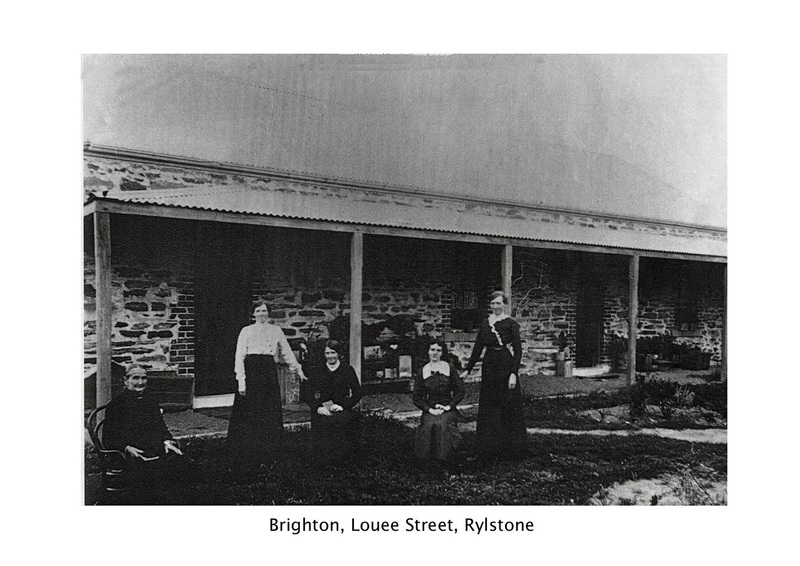 Wal's belief was that sharing history was the best way to create a living history for Rylstone and the surrounding district. In Wal's memory, the site will continue to operate as an online database and you are invited to contribute images and information. Please comment or email Dan Hatton at oldimagesrylstonedistrict@gmail.com. Photo: Kandos High year 9 history project in 1976. 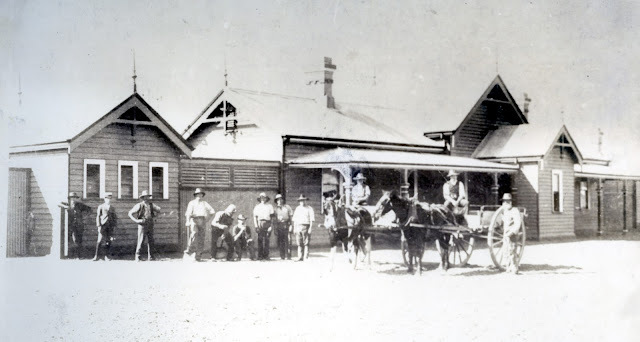 Rear-view of the station with 2 horse and carriages, 6 workmen, 3 townspeople. Ref: Transcript of the presentation by a Kandos High year 9 history student in 1976. Rear-view of the Railway Station. The weatherboard construction can be seen well. 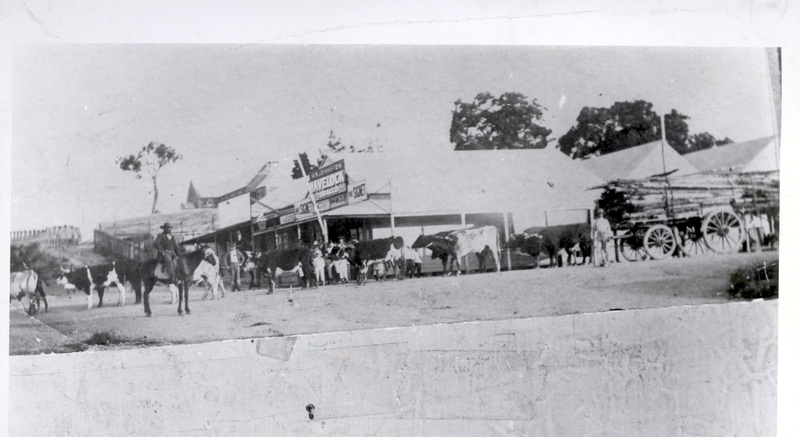 A horse and carriage and three other persons are waiting for the train. 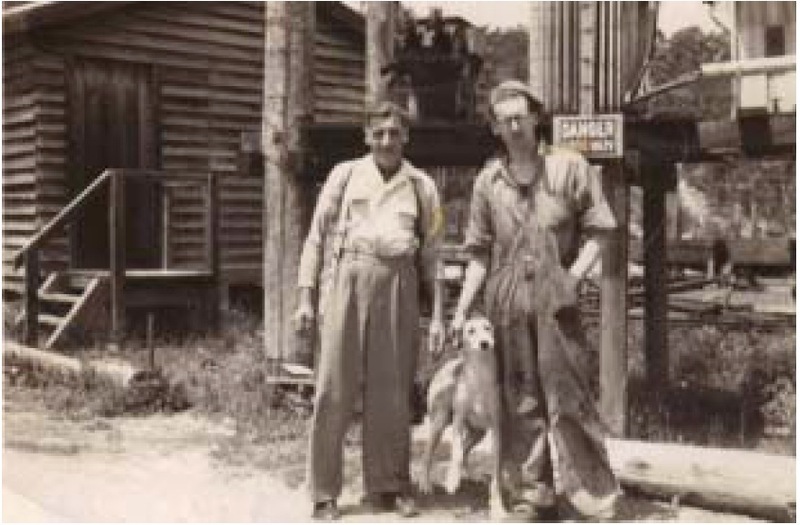 Pictured is water bailer, Harry McAlpine, colliery engineer, James Wilson and the colliery dog Rex at Tyldesley in the early 1950s. 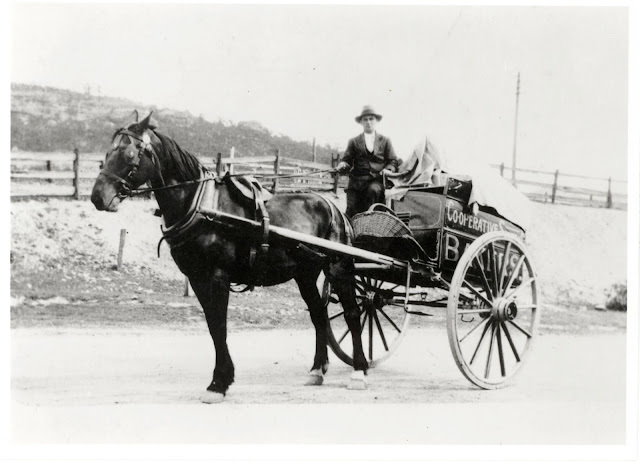 Harry and his wife Annie also ran the post office and general store at Tyldesley. Between 1888 and 1960 the area around Cullen Bullen hosted six underground coal mines, including Tyldesley Colliery which ceased operation in 1960. 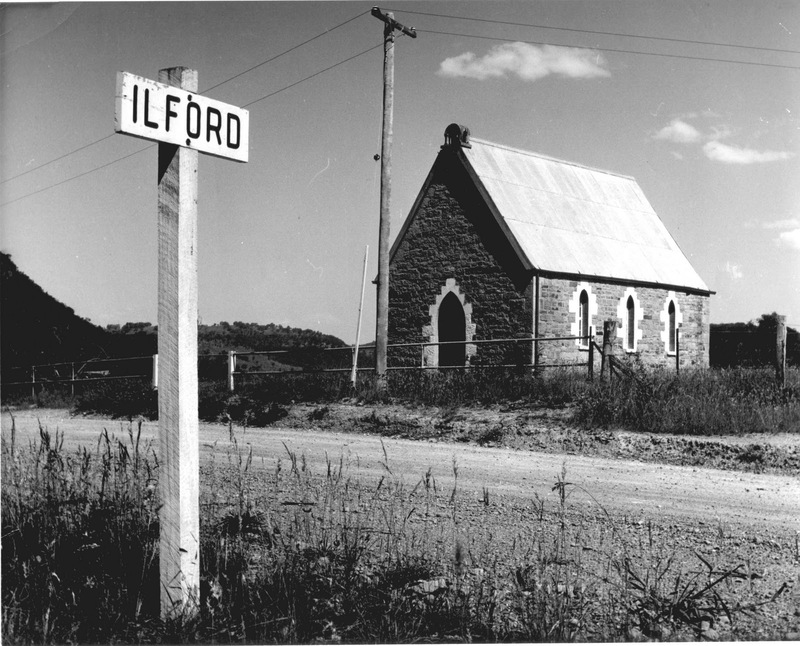 The village was largely abandoned by the mid 1960s and has all but disappeared from the landscape. Bogie Farm (sic) near Rylestone (sic), granted to Samual Marsden. 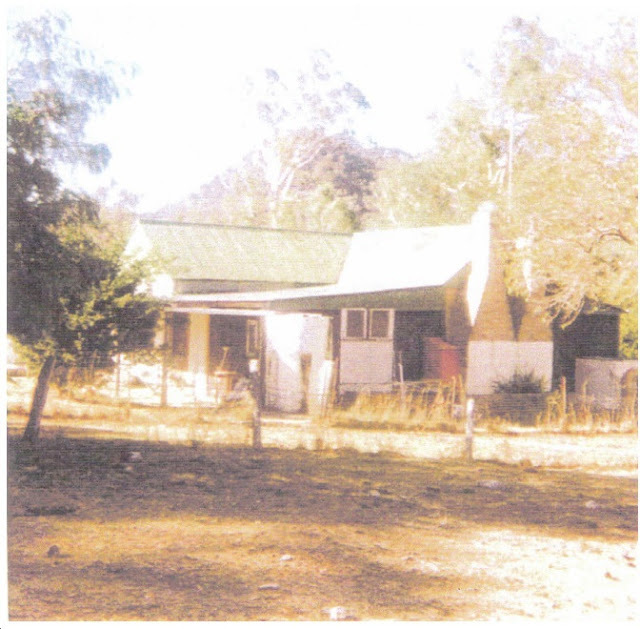 In the centre is the original homestead of Pili Slab with an addition in Fibro. 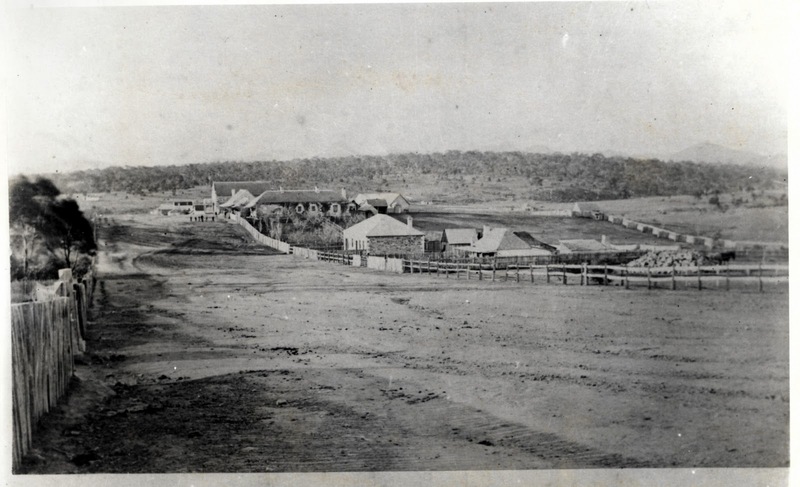 To the right (partly hidden by the large tree) is a Machinery Shed, Blacksmith Shop, Cow Bail & yards. Further to the right and further away is the Shearing Shed & Hayshed. Going to the left of the homestead can be seen the Meat Room and then in front of a small tree is the grave of Emily Ash, 3 months old from memory. Then to the far left (just in the photo) are the Shearers Quarters. 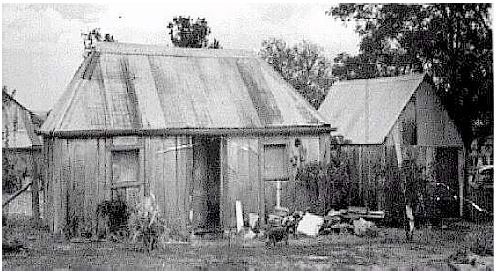 Behind the homestead is a sandstone floor/slab (iron bark) Garage with shot gun holes in slabs on eastern side where it is said they shot the attacking Blacks. 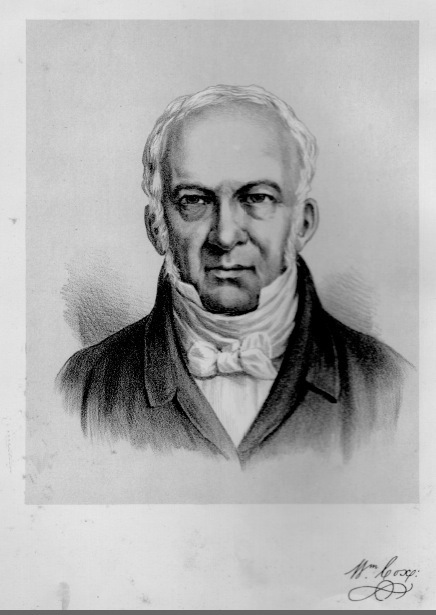 The photo is of Samuel Ferguson and his son Wallace. I believe the photo is taken near Sammy's Flat, which used to be in front of his house. 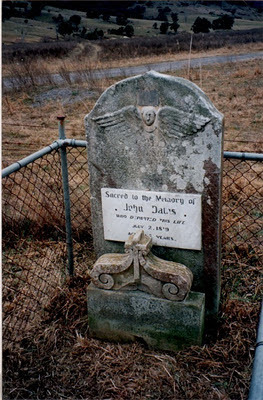 John died on July 2nd, 1848, and was buried on Dabee Station. In 1958, a fallen headstone was resurrected on Dabee, on the northern bank of the creek that runs into the nearby Cudgegong River. It is made of sandstone, and time has weathered the original inscription. A marble plaque attached when the stone was re-erected reads "Sacred to the Memory of John Davis, who departed this life July 2, 1819. 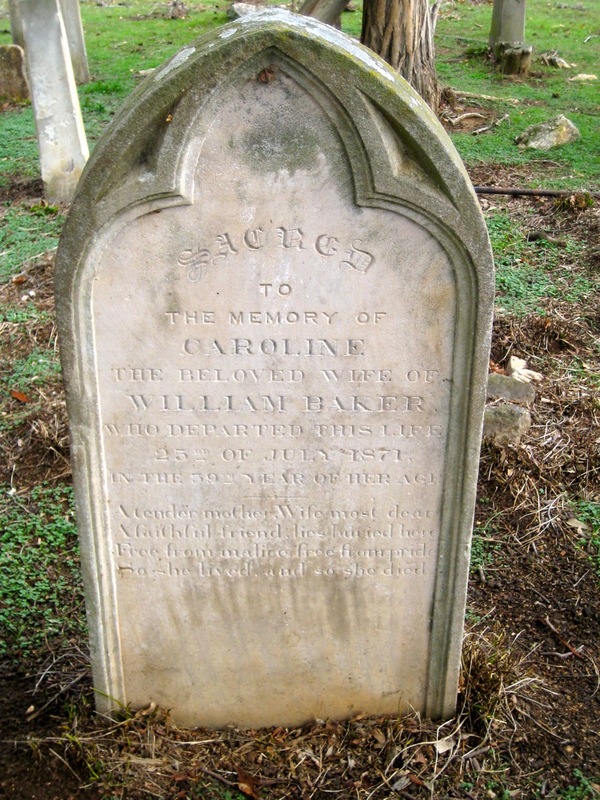 Aged 67 years,"
It seems fairly certain that the date should read 1848, and this stone marks the resting place of the Lincolnshire convict whose descendants settled so many of the properties in the area. Rylstone cows in the main street. 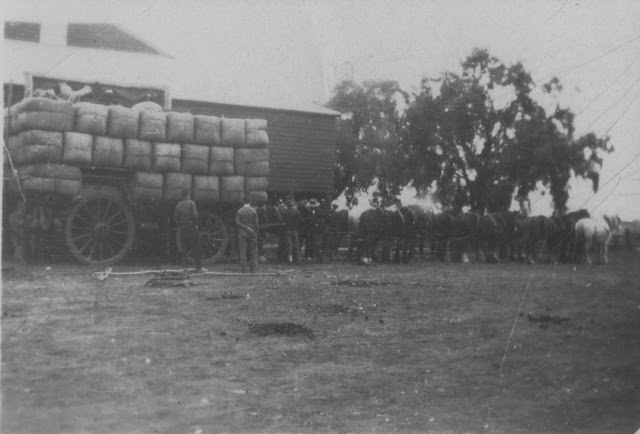 This is a picture of John Windle’s bullock team. At the left on his horse is John Windle. 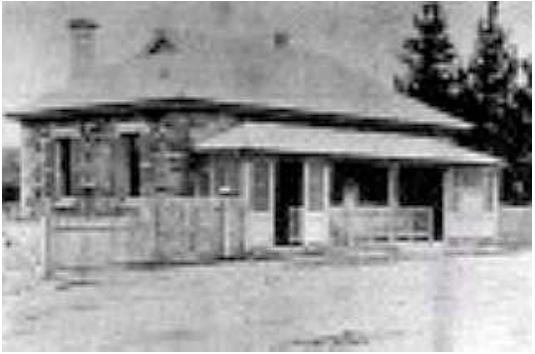 This photo was taken in front of McKenna’s corner. 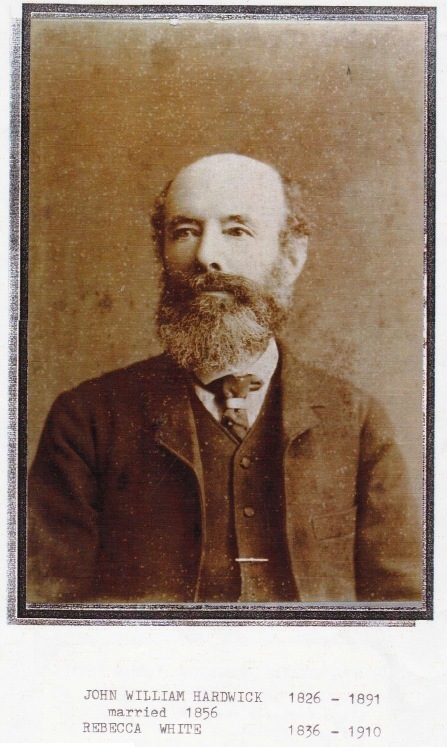 Far back behind John Windle is the Church of England. 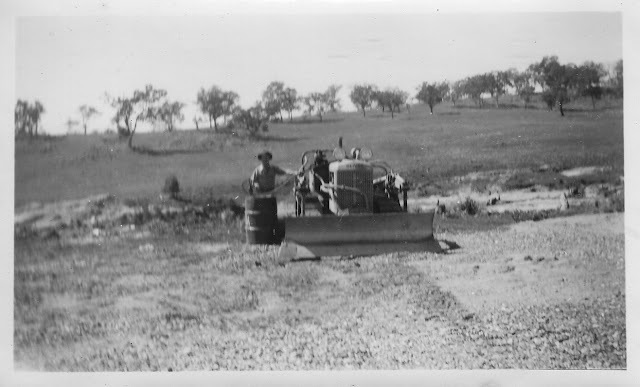 Photo: Taken before road lowered in 1940's. 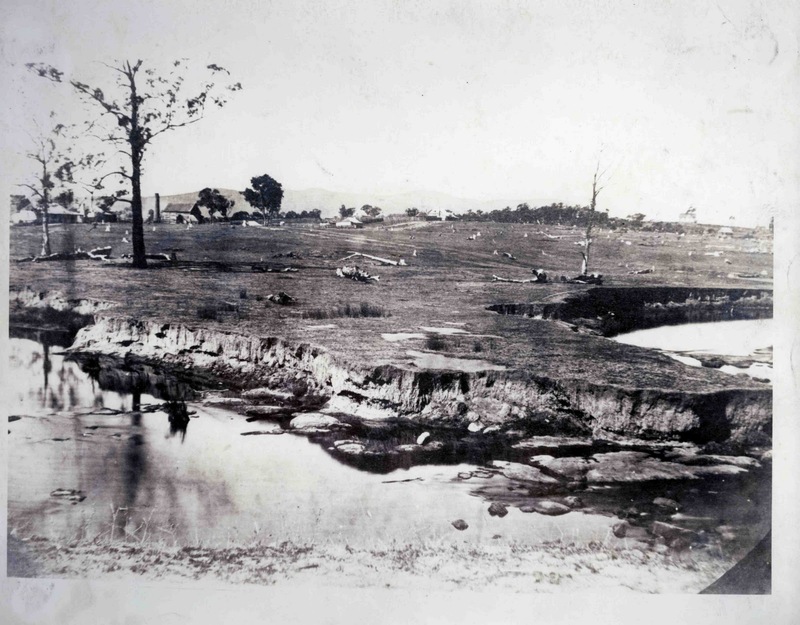 Ref: Cherry Tree Hill - Heritage Tour brochure. 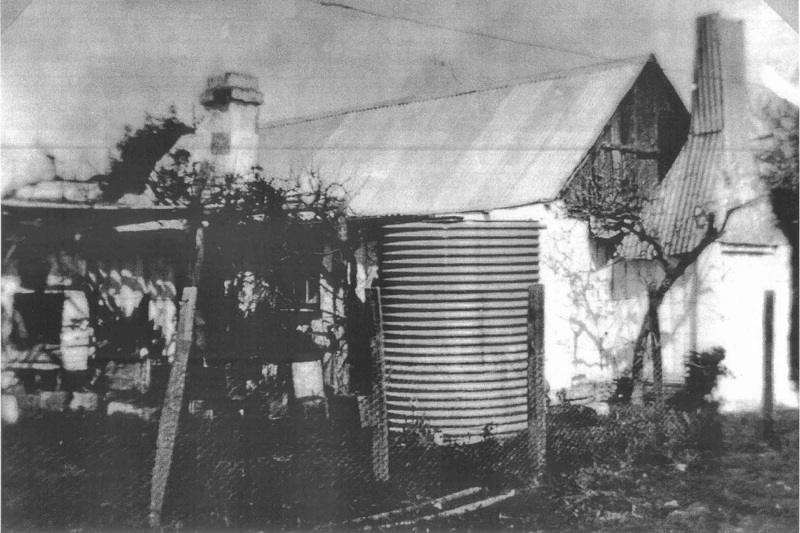 An example of one of a number of wattle and daub buildings which still remain in the district. St. John’s Union Church was opened and dedicated for worship by The Venerable Archdeacon Dunstan of Mudgee on 6th September 1906. It is probable that the photograph above was taken at the opening of the Church. 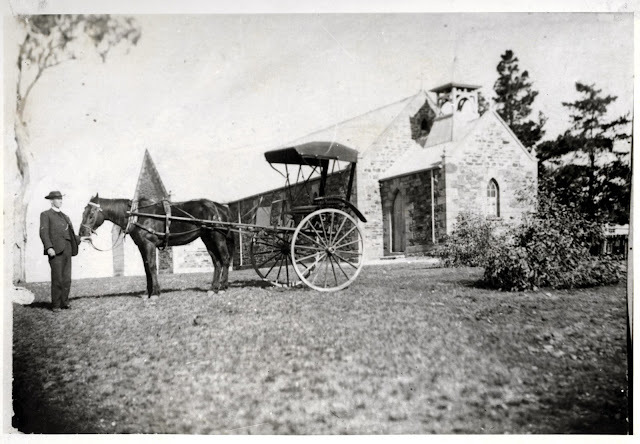 Ref: “REMINISCENCES” - SAINT JOHN’S UNION CHURCH at Running Stream by Peter & Pru Docker. 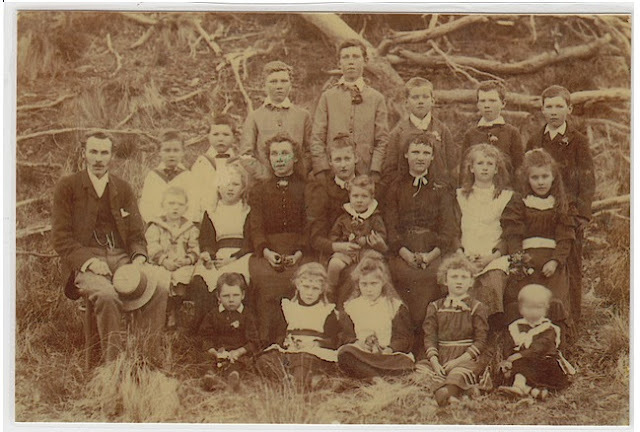 "Copy of a photograph in a family album formerly owned by the late Marion Hardwick. Now in possession of M.R. Hardwick. Photo courtesy of Margaret Hardwick, December 1997"
The Court House in Louee Street is an example of fine stone masonry work which is a feature of buildings constructed in the Rylstone Shire in the 1800's. Close-up of E.H. Nash’s grocery store. 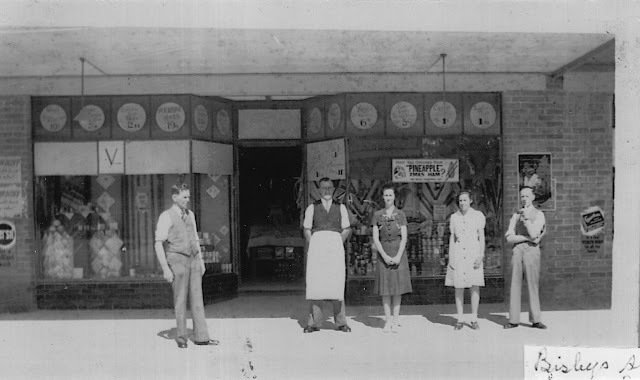 It has not changed much and might be recognized by some as the store owned by Mrs Hawkins. 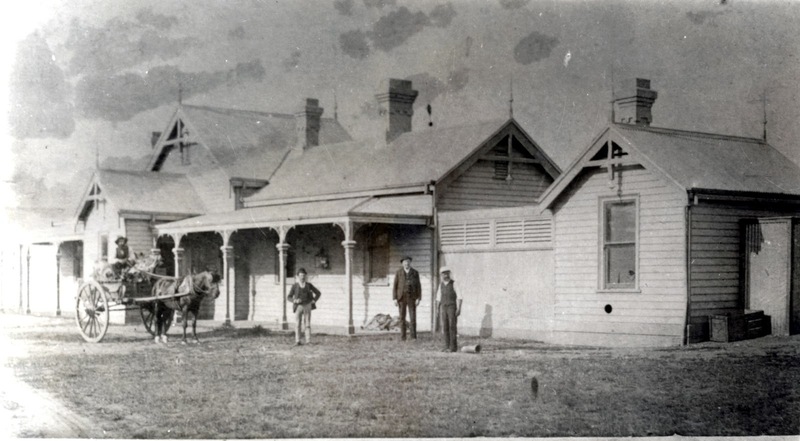 The tin part of the building to the left is not standing but in its place the Carlton Café. Is a picture of Louee St. On the left of this picture near the Black Cross stands the Globe Hotel. 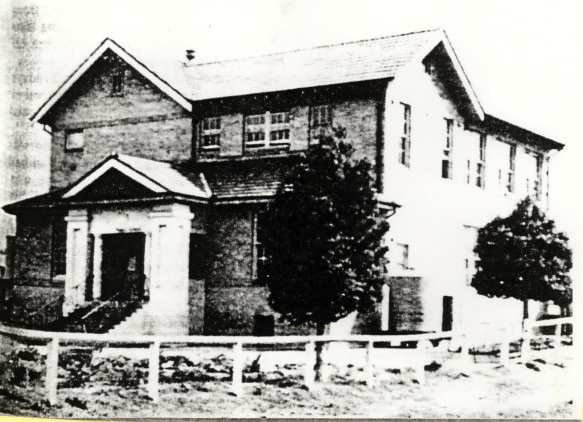 Where the picket fence runs, now stands the Bank of NSW and the Roman Catholic Church. 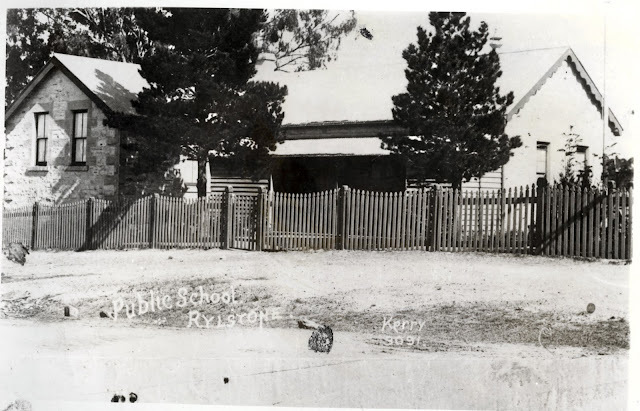 On the right hand side stands a building which has now been demolished. Another house, that of Mrs S . . . . . . ’s, now stands on the site. Looking down the street is the site of the Rylstone Hotel. Here again we see the Globe Hotel. Notice that the back has had extra rooms added. At the very back area of the hotel we see a group of small buildings which were presumably used as a stable. 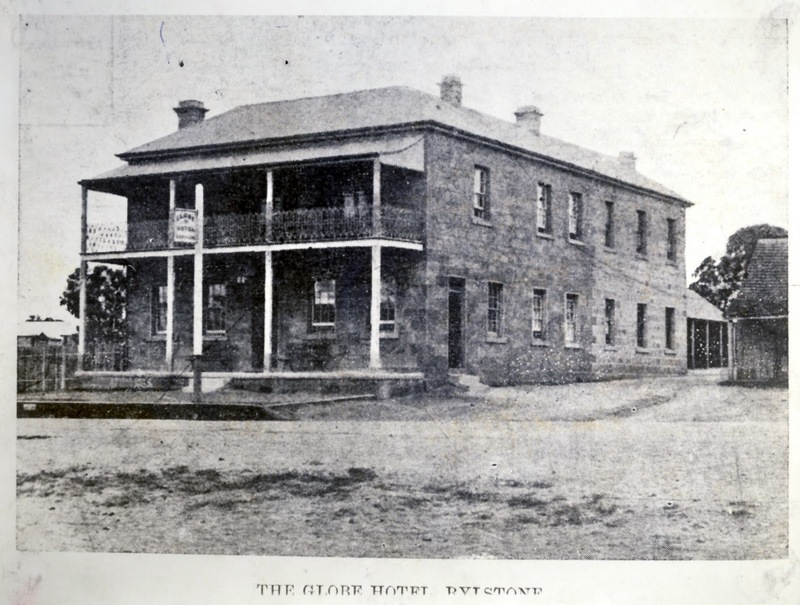 The Globe is still a prominent building in Rylstone although it now differs to what is seen here. This is Mudgee Street. looking north. 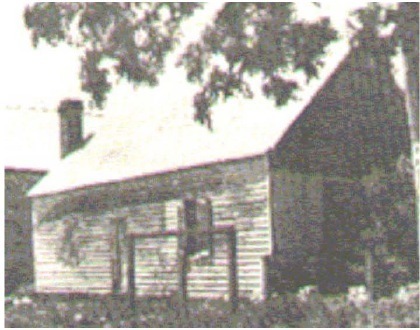 First House is a slab house, still existing to-day. 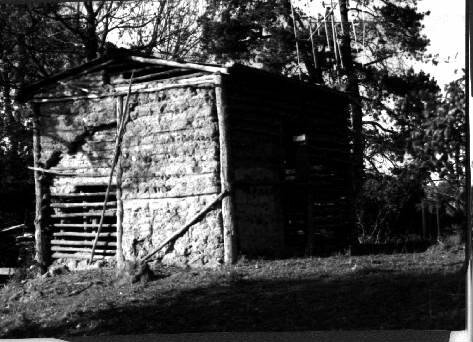 At one time it was a Blacksmith shop owned by Trains. Next House is Staffs, next Hedingly built by Hardwick, with old store next door then new Store, later to become the Masonic Lodge now privately owned. Past there is a glimse of James Brown's house then a flour Mill and the Shamrock Hotel. In the top right hand corner is Charlie Mulholland's dairy. There is still part of the dairy standing to-day. Jimmy Lambert (date of birth unconfirmed) is pictured here about 1860. 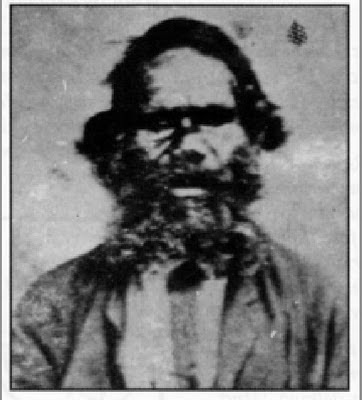 He was held in esteem, officiating at the opening of the second Cudgegong Bridge in 1871, after the original bridge was washed away in 1867. 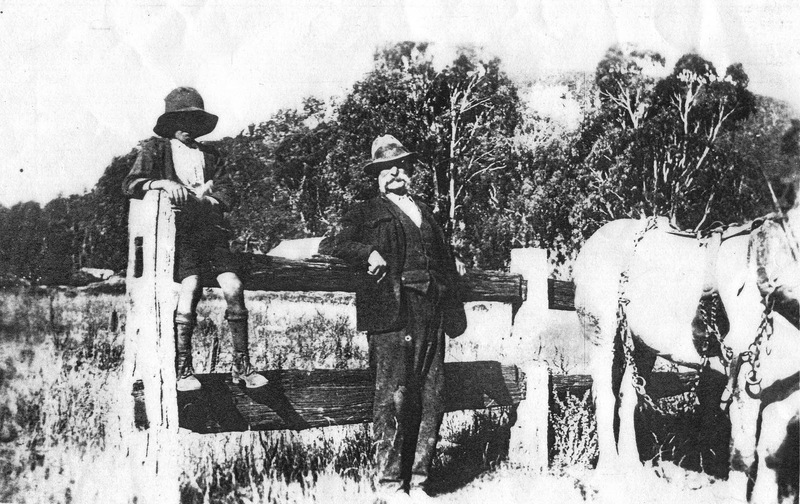 Jimmy died about 1882 and is said to be buried at Aaron's Pass, along with Rachael, one of his granddaughters. Photo: Milne Collection, National Museum of Australia, Canberra. Peggy Lambert (identified as Margaret Kirkness on the death certificate of her daughter Jane Rogers), born around 1830, pictured here about 1860. 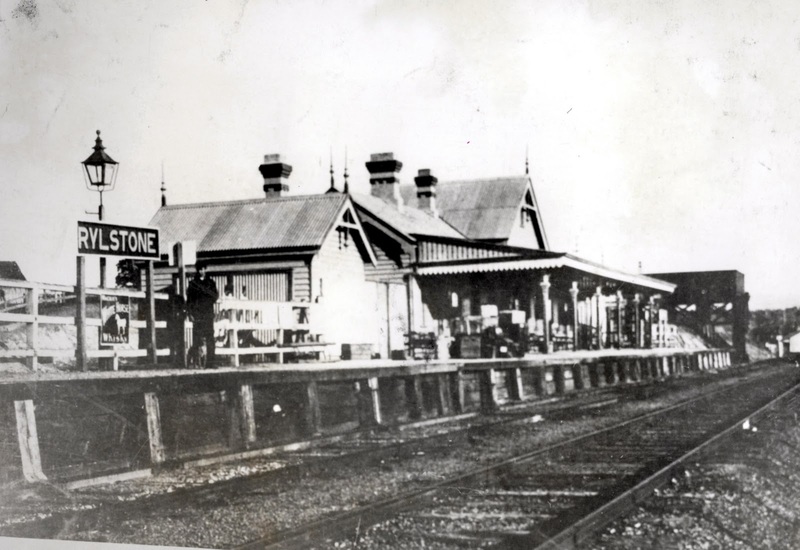 Peggy died in 1884 and was buried on the day the railway opened in Mudgee. 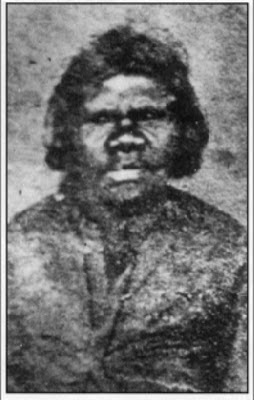 She often expressed a wish to be buried in a tree, according to the native custom, but her last resting place is in an unmarked grave in Rylstone cemetery. 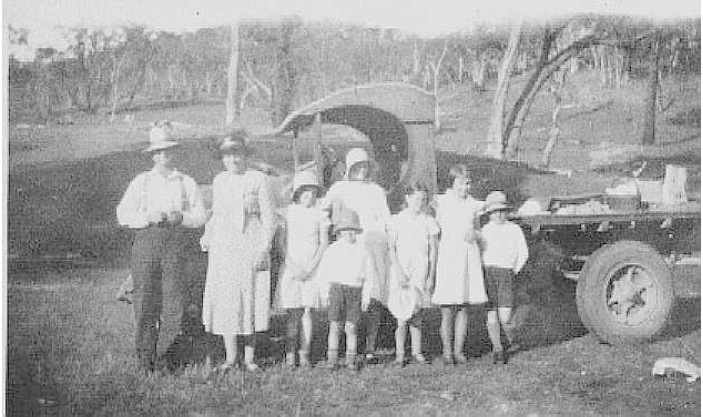 The people in this photo are from left to right Harry (Henry Charles) Franks, Grace Margaret Franks (née Cosier) then Peg (Ella Ma (Pigram) Madge Isobel Annie, Nellie Grace, Jean Margaret, Doug (Henry Doug) and in front Reginal Harvey Franks. The truck was bought new in Sydney for 595 pound with no cab or tray. The school is at the right of the photo. 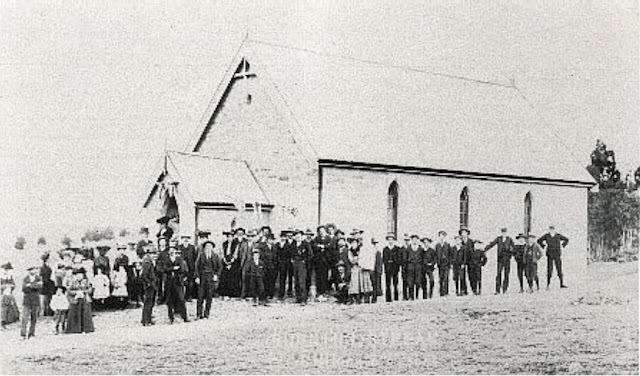 Marriage of Hannah Moss to Ernest Honeysett on 12 March 1902, held at St. James' Church Rylstone. 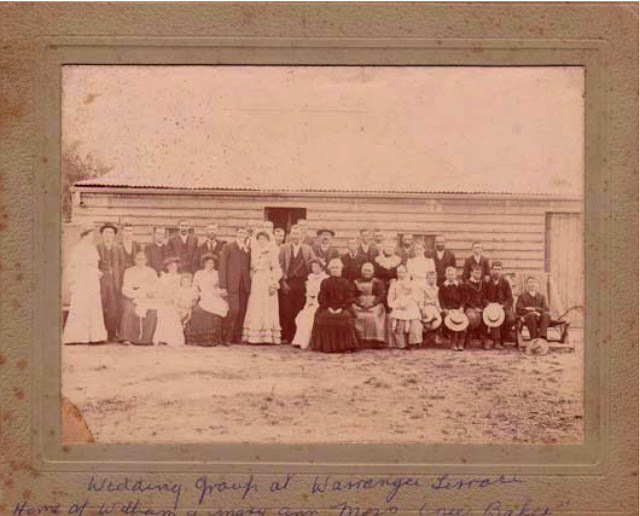 Wedding Group at Warrangee Terrace – Home of William and Mary Ann Moss (née Baker). 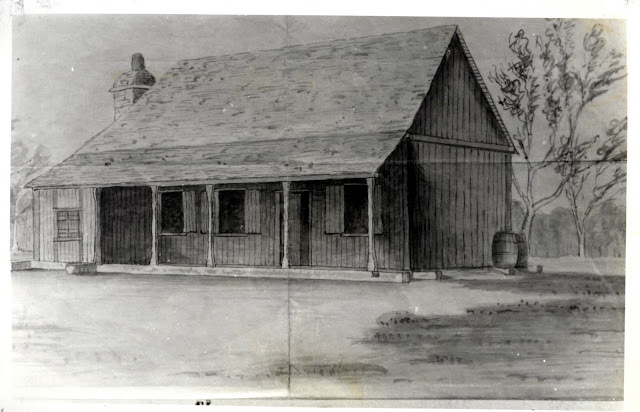 The first surveyors store was built in what is now Mudgee Street, in the earlt 1850's. 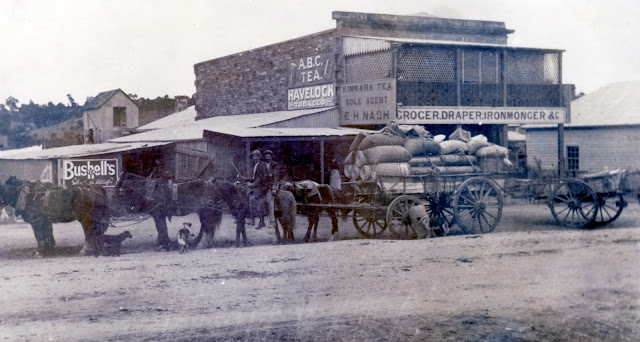 Hardwick settled on the site where he built "Hedingley" and Hardwick's first store. 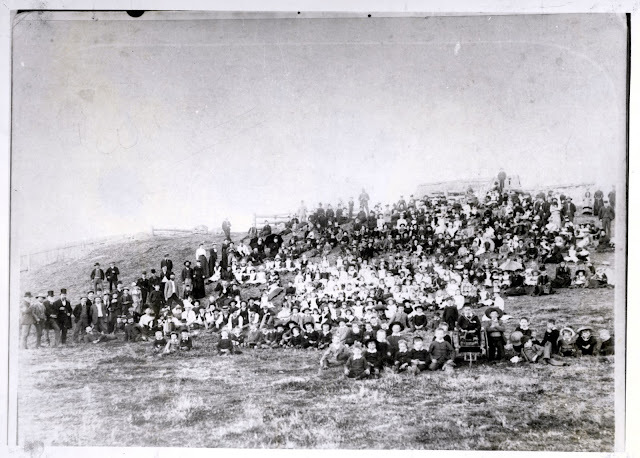 This photo was taken in the 1800's. 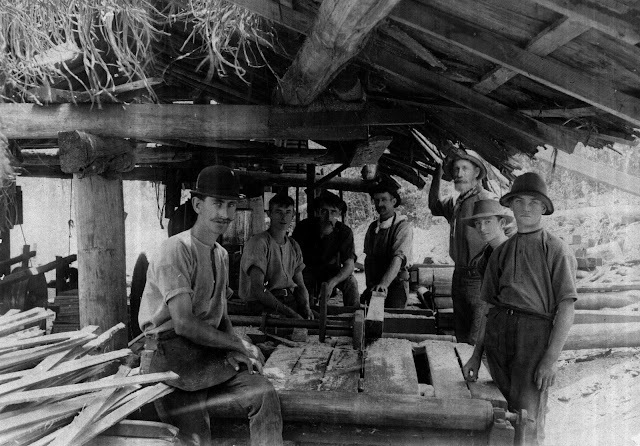 L - R Boy in back is Sidney Brown, there are Bisleys also in the photo. 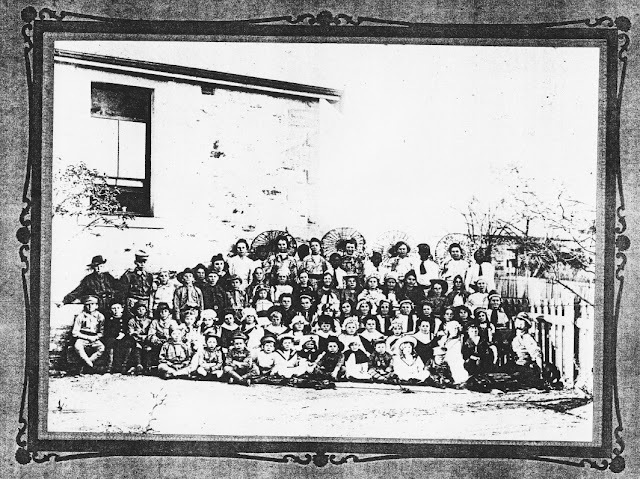 The 1st girl in front L - R Elsie Isabella Brown, next to her is Gertrude Brown. 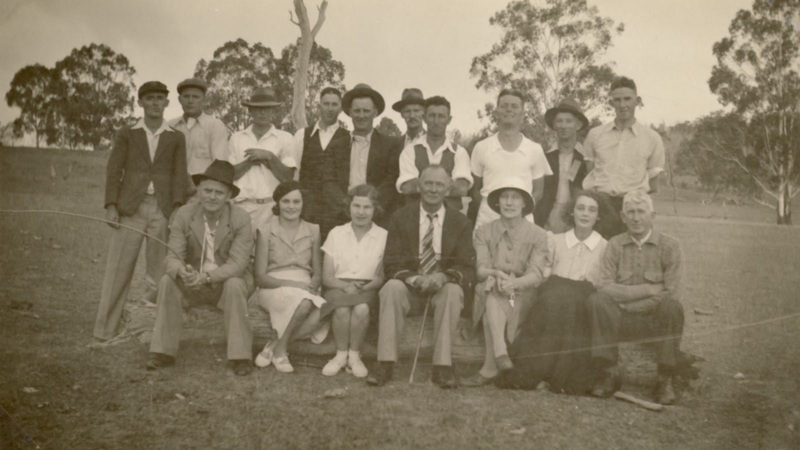 "Brookside" is at Reedy Creek beside the road and was in the Black Family for a long time, the last being Jim Black, who married Dodie Abbott nee Riches,after her death her Daughter Hazel Marchant and her Ray lived there before selling out and moving to Rylstone. 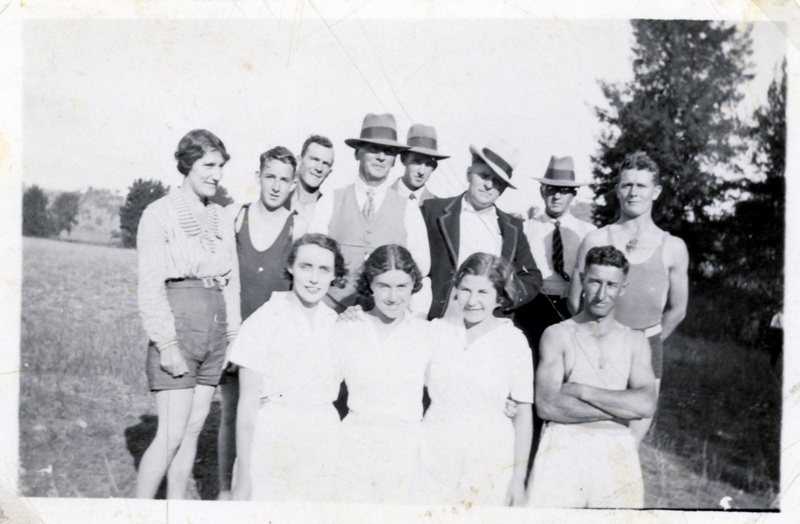 People in this photo are L - R Les Bisley, Lauchie Banks, Eva Hand, Dorothy Tatton and Nevell Bisley. 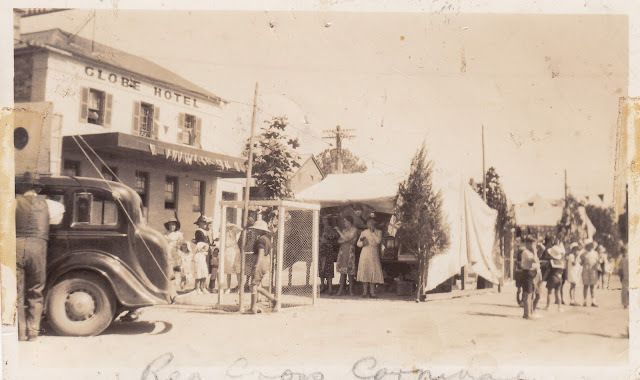 The woman in the light dress at the Red Cross tent is Mrs Elsie Mulholland, with her possibly is Mrs Stan McQuiggin. (Same house at difference angle) This is the front of the house. The house either became a Dr’s surgery. The small casks at the right of the house were used as water tanks. This was a primitive method of storing water. 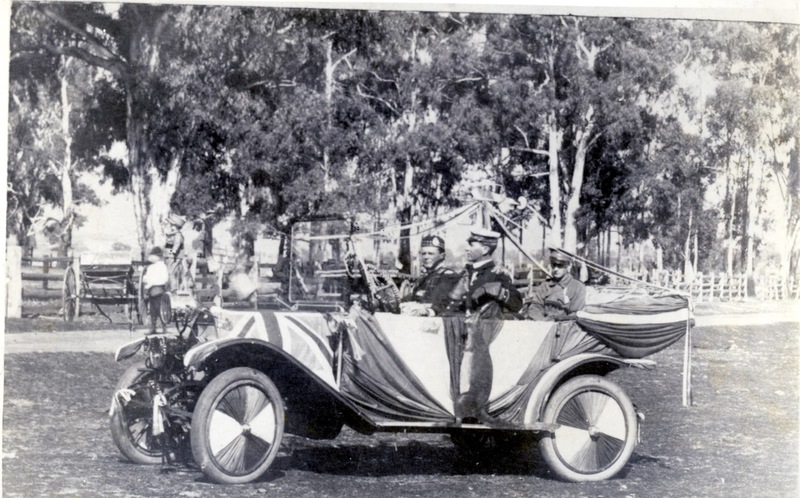 This is the first car in Rylstone. The driver was Dr Hansard, who also owned it. ‘Oakwood’ is in the Capertee Valley, at the end of a dead end valley, at the foot of Mt. 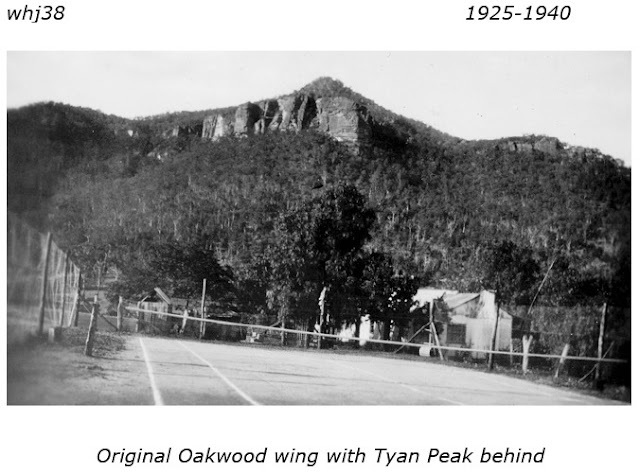 Tyan, known locally as Tynan Peak, the highest local mountain. We have here the Tong Bong Creek joins the Cudgegong River. 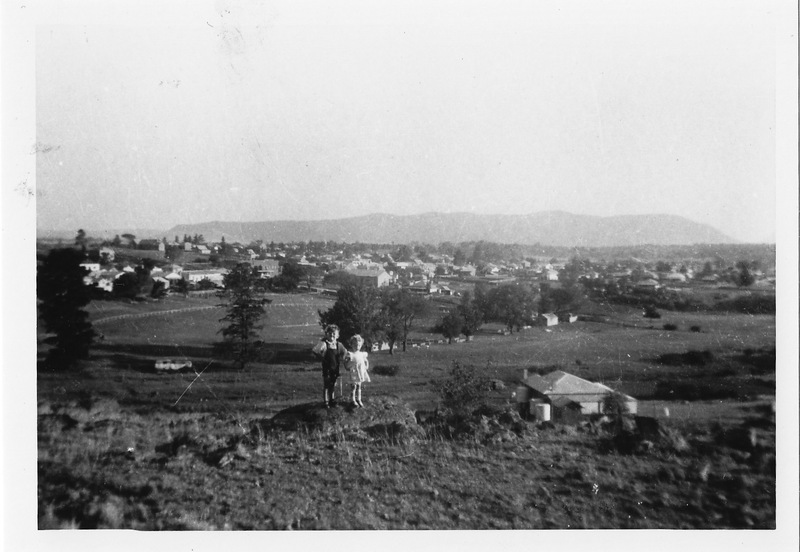 And in the left centre of the picture we have the second flower mill that was built in Rylstone and on the far left we have Shamrock’s Hotel or Shamrock’s Inn and a man was killed in the bar of Shamrock’s Inn and he was found about 2 miles along the Bylong Road and so there wasn’t any trouble they made it as if he had fallen off his horse. In the centre we have Dr Howe’s house in Mudgee St in early 1860’s. 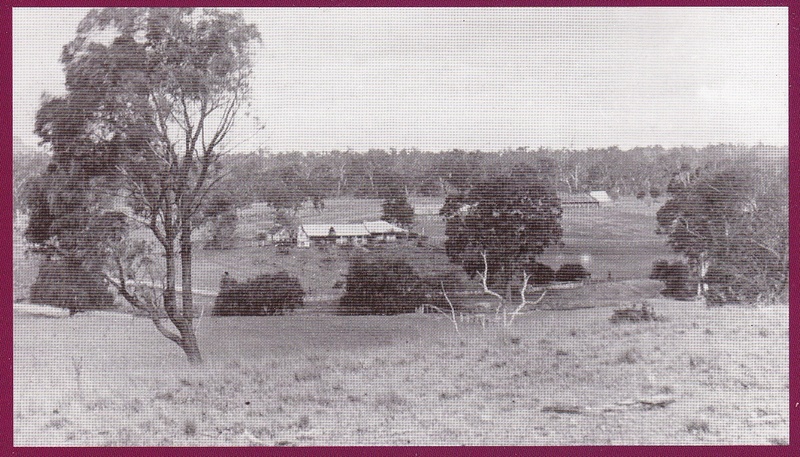 This photo is taken from the Bylong road looking south. You will notice that the railway hasn't come through yet. In the distance, right top hand corner is Hardwicke's store, below this is James Brown's house in Mudgee Street, coming down to the east is the Shamrock hotel and the Flour Mill. This should be in the late 1800's. The site has many images - 50 newest posts display at first - browsing/scrolling down to bottom gives links to newer and older posts. To search for a topic, check the Index of Labels. To share an image, click on relevant icon at bottom of post.